In the afternoon, the PA came over to access her port and give her the scheduled vincristine dose after drawing labs. Within minutes of the PA leaving, Isabella started crying even more inconsolably (she should have been calming down by that point), and complaining of a severe headache all over her head. Then she began shaking all over. It was so bad, I thought she was having a seizure at first, but she was able to follow directions. Then she started vomiting. We were trying to calm her down, but anywhere we tried to touch her seemed like it caused severe pain. By the time the nurse came in and got the resident, who saw her and called the attending, she was still crying and shaking, but so exhausted that she was dosing off in between screaming spells. We couldn't believe this was an exagerated anxiety type of response to having her port accessed (both other times it was a terrible experience - done as an "emergency" without numbing), because of how severe her symptoms were. The part that bothered me was that even as she was falling asleep, she was still shaking. Finally her nurse came back in to do her vitals, and her temp was 103.7! Her oncologist came over from clinic within a few minutes and sent us right up to the inpatient floor. Her bloodwork had come back, and everything had dropped severely from 2 days ago - she was neutropenic (neutrophils 400), and on the border of needing platelet and packed red cell transfusions. The doctor's theory makes sense - her port was infected, but not causing any symptoms until it was flushed and pushed the bacteria into her bloodstream. That's why she was completely fine before the infusion, and it hit her like a ton of bricks a few minutes later. I could tell everyone was nervous, because the nurse at Rusk brought her up without waiting for transport, and the nurse on the floor "stole" the antibiotics from the pharmacy without waiting for Isabella's name to be admitted into the computer (there was some kind of computer problem). I got nervous when they re-accessed her port and she didn't put up the usual fight - she barely complained. She's now on 2 "big gun" antibiotics, pretty much covering any bacteria you could acquire in the hospital. Isabella perked up within an hour or two and is back to herself again. She took a long nap, and then we spent the evening playing cards. We're waiting to see if she'll need the transfusions tomorrow. How long she stays on this floor is still up in the air. Click the title to view an article that ran in today's New York Times about Dr. Jeffrey Allen. He's a neuro-oncologist and part of the team at NYU that is treating Isabella. Julianne and I are utterly amazed with Dr. Allen and Dr. Sharon Gardner who is the other neuro-oncologist that we've been working with. This article basically confirms the hours that we expect they put in on a daily basis and wonder how they have a life outside of the hospital. In any case, we're grateful that there are people like them who are committed to treating and curing children like Isabella. We had a great Christmas day at home and have plenty of photos and video from the day that we will post later. Last night, we brought Isabella back to Rusk. Today, Isabella got her last dose of Vincristine, which now officially ends her first cycle of chemo. During the push through her port, Isabella developed a bacterial infection and immediately spiked a fever. She was just admitted to the Pediatric Unit where they are giving her antibiotics while they check her blood cultures to see exactly what could be in there. Right now, Julianne is with her and Isabella is feeling better. 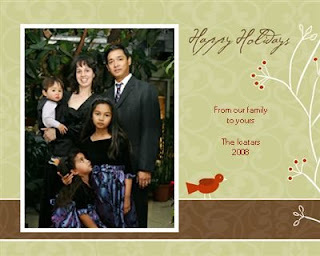 On behalf of the rest of our family, I would like to wish everyone a very, Merry Christmas and a Happy New Year. The last few weeks have been extremely challenging, and we have many more weeks ahead. I am positive we wouldn't be able to get through this without the tremendous support from our family, friends and community. It is amazing and truly humbling how some people who we hardly know display such compassion and selflessness. Just like Thanksgiving, this Christmas will be different from the ones we've had before, but not as different. I will be taking Isabella back home in the morning and all the kids will be able to open their gifts as usual. And later that night, we'll take Isabella back to Rusk to continue her rehab. But once again, we are all praying for a miracle and that a year from now, we will be celebrating with a cured Isabella. The doctors have OK'd Isabella to come home tonight for Christmas Eve! She has completed her full day of therapy and we will be on our way home shortly. This will allow her to be part of our traditional Slovak Christmas Eve dinner. Unfortunately, she is not allowed to stay overnight, so I will be driving her back to the hospital later tonight. Then, we will get up bright and early and go back home for Christmas day! They did a routine blood count on Isabella today to check her white cell count. Her white cell count had been drastically lower since the chemotherapy, which makes her susceptible to infections. She has been receiving medication known as Granulocyte colony-stimulating factor (G-CSF or GCSF), which assists the body in regenerating her white blood cells. The doctors expected Isabella to have a low count until at least the end of this week. Even before the doctors began the GCSF on Saturday, they had noticed that Isabella's white counts were starting to improve! Today, the measurement showed that Isabella is no longer neutropenic - she is still below normal, but her body seems to be recovering very well from the chemotherapy. She still has a little nausea, but overall, she's doing great. Her walking continues to improve, but her right hand will require more time. She just has one more day of rehab on Wednesday (Christmas Eve), then she comes home for Christmas! Here is Isabella goofing around with her best friend, Imani, here at Rusk. They are wearing sunglasses that they received in one of the many goodie bags from contributions. Isabella loves playing with Imani, who is one of her roommates. When Isabella was in the pediatric unit for a couple days, Imani would ask us everyday if Isabella was coming back. And when Isabella did eventually come back, she was happiest to see Imani out of anyone and they immediately began playing with their toys. Isabella is now back at Rusk after a nice, relaxing day at home. This was her first time home and out of the hospital in over a month. All the kids were excited to finally be home together. When we got home, we had a little lunch, the kids ran around, Isabella was getting a little too enthusiastic with her siblings so we had to calm them down a little. We played some video games (Rock Band) and listened to some Christmas music and danced around the living room. We took a nap, had some dinner, then played some more video games before coming back. It ended up being a typical Sunday at the Icatar household. It was definitely nice to be home and feel a little sense of normalcy, even if it was just for a few hours. We'll have a couple days of rehab therapy as we wait for Christmas when we'll head home again. We just got home from the hospital. Isabella couldn't stop smiling the whole ride home, she was so excited. When we got home, her brother and sister were also excited to see her. Nathaniel kept pointing to her and saying something (we think it was "Bella"). our Christmas tree, Cleo our cat, and her fishes. planned for the day except a lot of sitting around and relaxing. have some pics posted later.